I like the drive back from my sister’s house back home. The very slow traffic gives you ample time to appreciate some of the more unusual signs in New Cross. Why is it that often Chinese takeaways have a habit of having such brilliant, whimsical names that they cannot fail to bring a smile to our little faces? Closer to home, I always like seeing the lovely-named Lovely House on Bellenden Road in Peckham. But the New Cross road is really rich. There’s Go Sing. It’s just so joyful! 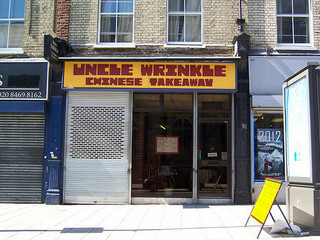 And then, the wonderful Uncle Wrinkle. You don’t why, you don’t know what it means, but you like it! It always heartens me that just a couple of well chosen words can really cheer your day.